We’re excited to host a series of post-show parties with the Wallis Annenberg Center for Performing Arts after Thursday performances of Kneehigh Theatre’s 946: The Amazing Story of Adolphus Tips. AfterParty at the Wallis is an exciting opportunity for theatergoers to experience a show at an affordable price, and stick around for drinks and mingling with Wallis artists and friends! Kneehigh Theatre works with an ever-changing ensemble of performers, artists, technicians, administrators, makers and musicians. They return to The Wallis with 946: The Amazing Story of Adolphus Tips, a show that explodes everything we thought we knew about the D-Day landings in a tender tale of love and war. Kneehigh’s signature sorcery of music, puppetry and foolishness promises to transport and delight audiences! Check out some highlights from the previous AfterParty @ The Wallis below! Interested in attending the next one? 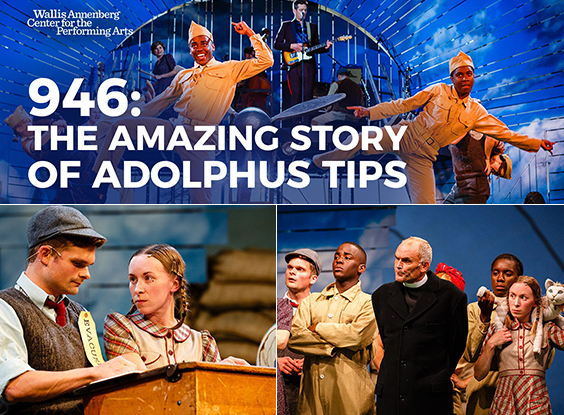 We’re hosting AfterParty after Thursday night performances 946: The Amazing Story of Adolphus Tips, beginning on February 9th. Bring your friends…and be prepared to make some new ones, too!